A French man has become the first person in the world to have two face transplants, according to media reports. 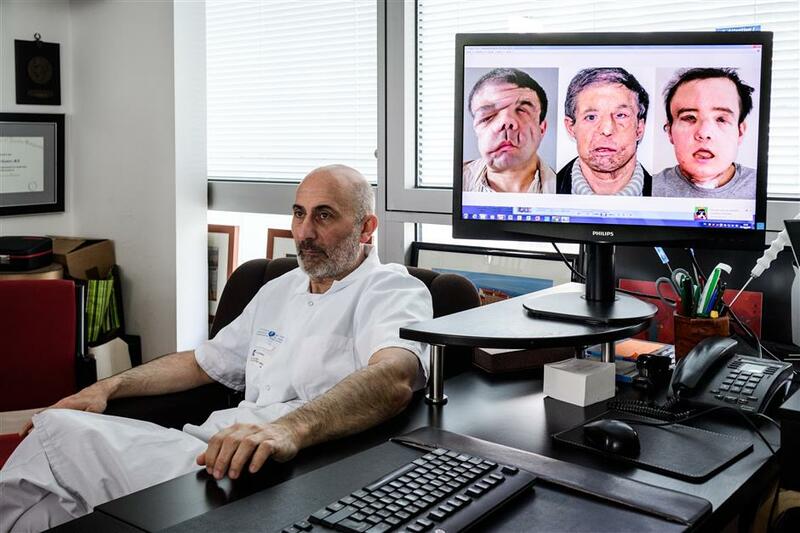 French medicine professor Laurent Lantieri, a specialist in hand and face transplant, poses next to a screen showing different steps of his patient Jerome Hamon's surgery on April 13, 2018 at the Georges Pompidou European Hospital in Paris. Jerome Hamon is recovering in a Paris hospital, three months after receiving a second transplant, which is considered a world's first. The 43-year-old suffers from neurofibromatosis type 1, a genetic mutation which causes severe disfiguring tumors on his face, the Guardian reported. Hamon underwent his first transplant in 2010, but his body eventually rejected the new face, which had to be removed in 2017. Without a face, Hamon had no eyelids, no ears, no skin and could not speak or eat. He remained hospitalized for two months till a second donor was available. The second transplant was performed in January. To avoid another rejection, doctors replaced all the blood in Hamon's body in a month-long procedure before carrying out the surgery. Hamon's first face was donated by a 60-year-old. With his second face, the man joked that he had managed to drop a few decades. "I'm 43. The donor was 22. So I've become 20 years younger," said Hamon in an interview with French television. According to the BBC, the world's first face transplant was carried out in 2005 in northern France. Since then, some 40 operations have been performed in the world.